Musty odors typically result from materials deteriorating by water or moisture vapor supporting mold growth. Water leaks are typically due to plumbing, drainage through the foundation walls, missing or incorrectly installed flashing, and anything sloping anywhere toward or into the building. Water vapor problems result from high humidity originating indoors or out. Another culprit is missing, unused, or under-utilized ventilation or heating & cooling systems. Missing or improperly installed vapor barriers or retarders are also a major factor. This common complaint discussion is in two parts. This blog post focuses on indoor moisture sources. The last one considered outdoor sources. Plumbing Leaks. This source of moisture is a no-brainer for mold growth. As a matter of fact, plumbing leaks set up conditions slime molds love because it keeps their slime jacket moist. Watch out when the leak is fixed! The slime jacket dries out and releases scads of mold spores. The leaks that’ll gettcha are the ones you don’t see (until you smell it or the floor rots out). Ineffective Ventilation. Our indoor living activities are enough to fill the house with moisture vapor. Add weather coming through the holes in floors, walls, and ceilings. Continue by adding crawlspace soil moisture. Also, don’t forget the water vapor expected to come in from outside through the drywall. There’s a lot of moisture to exhaust out of the house! Otherwise, it supports mold growth inside. Spot ventilation is needed in bathrooms and kitchens, because these are moist rooms anyway. Whole-house ventilation may be needed too—especially if the house is air tight. Under-Used Heating & Cooling Systems. The saddest and most unnecessary mold problem occurs when people shut off an air conditioner to save money during the Southeastern summertime to save electricity (and money). A week later, mold will be all over cabinets, walls, floors, ceilings, and personal items. More than $10K to save $100? Hmm. My friends on the coast of California aren’t any better off in the winter time. To save money, they turn the heat down—below what is needed to maintain relative humidity less than 50%. Mold is usually found along exterior walls, behind furniture, boxes, drapes, and bedding. Another type of under use is oversizing the air conditioner. They make the house cold—quick—without removing enough moisture. Mold will be everywhere and on everything. Right sizing heating & cooling equipment and ductwork solves this problem. Non-Existent or Unsuitable Vapor Barriers/Retarders. Ventilation fans and heating & cooling systems are intended to handle indoor sources of moisture. They are overwhelmed by weather and crawlspace evaporation. If you have a crawlspace, install a proper vapor barrier over the ground. Air sealing and duct sealing will keep most weather-induced moisture out. My friends in cold climates face the problem of indoor moisture trying to migrate through exterior walls–from inside to out, causing wall cavities to get wet. Mold loves it in there! 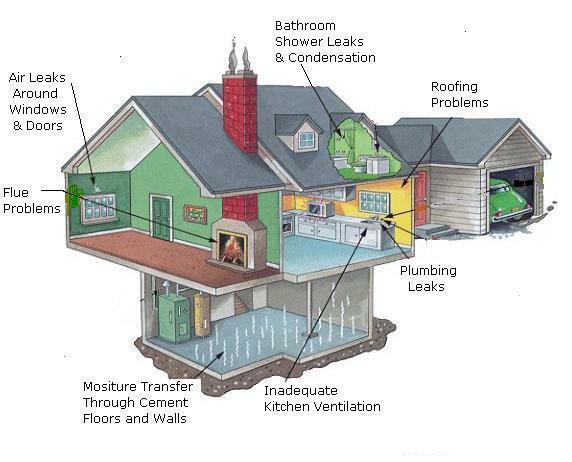 Moisture out of control is a home performance problem leading to mold and musty odors. Diagnosing and correcting air leakage, insulation, ventilation, and HVAC equipment sizing is found on our home performance website. The whole subject of mold inspecting, mold testing, and mold remediation is found on ourmold website. I’ve talked a lot about crawlspace moisture wrecking havoc on a house. Before talking about damp crawlspaces, I’ll tackle damp basements next. A crawlspace is a mini basement with special features.